What is consciousness, and how can we awaken? Inside, you will find a powerful compass, along with daily body-mind practices, to part the curtains around the theater of the world. Come unfold your potential! 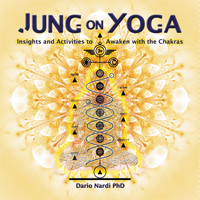 In 1932, renowned analyst Dr. Carl G. Jung gave four talks on the psychology of kundalini yoga. You may know Dr. Jung for his work with archetypes, ego, functions of personality, the shadow self, and other aspects of psyche. This book adds to those. It is a tour of his words and wisdom on the chakras, reorganized and couched in more everyday language and plentiful graphics for the benefit of all. Jung's views contrast with most views of development today, which either reduce human beings to biological machines or seek to prop up the ego. Here, you will find ways to get energized, remove blinders, and let go of unpleasant tensions, false identifications, and excessive cares. Shipping Time: Please allow 7 business days for orders within the USA, or 3 weeks internationally. Please contact us if you need faster delivery. Copyright Dario Nardi, June 2010. Please contact us regarding the use of written and/or visual material on this site.